Item number Ef259 from the MOA: University of British Columbia. 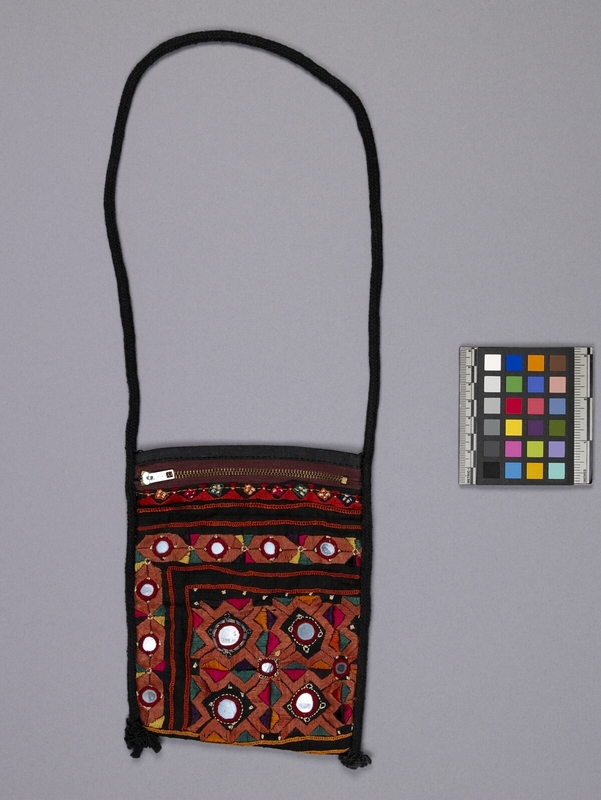 Flat, two pocket pouch faced with black hand-woven cotton decorated in embroidery and mirror work. Green, yellow, purple, brown and pink cotton thread. Mirror pieces (9 of 1 cm. diameter, 4 of 2 cm.) sewn with buttonhole stitches. Metallic thread holds largest piece. Zippered closing. Double fabric backing and inside sleeve of black mill cloth. Tubular black braided cord arm strap attached to side seams as decorative binding. In northwestern India, fancy embroidery, especially that which includes small mirrors is a popular decorative aspect of pouches, purses, bags, clothing, and furnishings. In this object, an older piece of northwestern Indian embroidery has been adapted to a tourist item for sale in handicraft shops or, as in this case, by Rajasthani women on the street, especially in front of American Express offices. This is an example of the way in which traditional skills are quickly adapted to contemporary needs or purposes. This pouch is used to hold a passport.